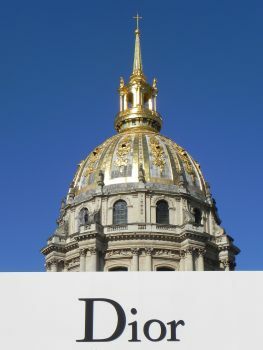 Yes, it’s true … we were THERE, at the Dior Fashion Show at the Hotel Nationale des Invalides! Friday, September 28, was the Dior spring/summer fashion extravaganza and the first pret-a-porter show for their new creative director, Raf Simons. It was the talk of Paris and the fashion industry (and our dinner table) for days. Of course we aren’t House of Dior clients. 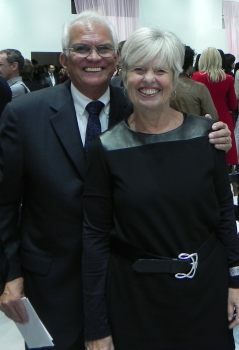 The story of how we were invited could be a blog entry itself, but the short version is that 30 years ago Perk worked with a young man at AC Nielsen who is now the CEO and Chairman of Christian Dior. 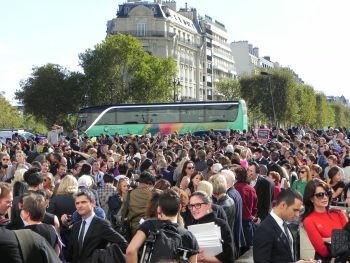 When Sidney Toledano learned that we were in Paris for two months, he invited us to the event…and what an event! 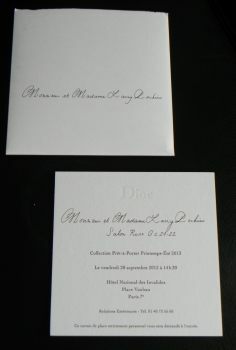 First, of course, I panicked … what to wear to a House of Dior fashion show! 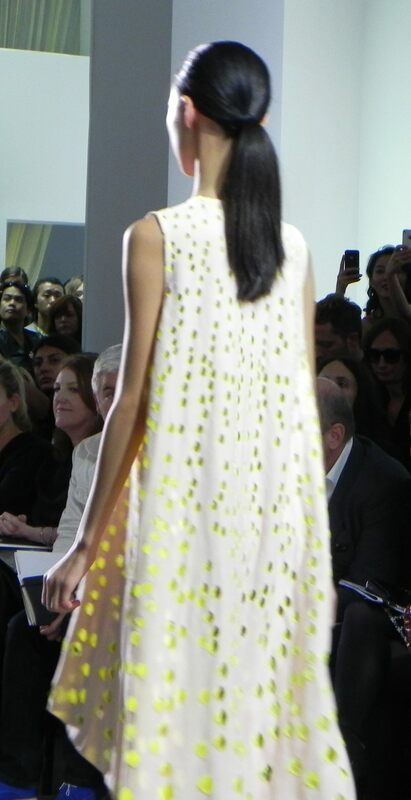 My niece Diana Lee, a knit designer for Proenza Schouler, calmed me. This event was not high fashion couture, but pret-a-porter, ready-to-wear clothes for spring and summer fun! I called and emailed friends in the States for advice. The invitation was delivered on Thursday, just 24 hours before the show; it was on embossed card stock about a quarter of an inch thick (and unlikely to be able to be forged!) We put it away carefully, knowing that we would have to present it to enter the event; we didn’t want it to be tattered and wine-stained from lying on the kitchen counter! Friday arrived. In honor of the event, we decided to forego the Metro and take a taxi. The driver was blasé about just another fashion show. But he loved that we were excited and enthusiastic, and promised to get us there by 2:30 PM despite the traffic. He had obviously passed his NASCAR test, squeezing out buses and other taxis to get into the faster lanes. Carried away, Perk shouted, “Bravo” when we left a Peugeot driver blowing his horn in frustration at being cut off at the light. The venue was unique with separate rooms where guests had assigned chairs. 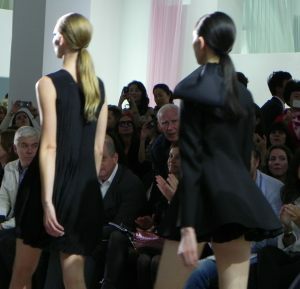 The models would not parade, turn and walk back on a raised catwalk as I had seen in countless videos. Instead they would walk from room to room through wide aisles among the guests. We were surprised to find ourselves seated in the main room, the Rose Salon, in the section reserved for the Toledano’s, the Dior designers and the supermodels! 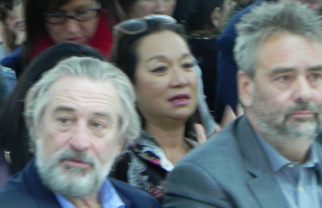 Across the aisle were Robert DeNiro and Kanye West. Random photographers, who took our picture as we sat among the models and others of renown, are probably scouring their archives trying to figure out who we are and why we were there! At 3 PM the show started – pulsating music built the anticipation. Cameras clicked on, telescopic lens whined into position, and a series of reed-like models in aqua, lime green, orange or pink glittery cat’s eye make-up, strode past us, made an abrupt turn in front of the press photographers and continued their parade into another room. One every fifteen seconds. Ponytails swinging. One beautiful ready-to-wear item after another. Tuxedo bar suits. A-line dresses with sassy pleats. Floating, flowing organza gowns with shimmering designs. And short, SHORT skirts! Reviewers called the designs “edgy and minimalist.” I called them beautiful, but for the items to be “ready” for me “to wear,” I would need to add another 12-18 inches to the hems! It was over in 15 minutes! Raf Simons in a denim jacket jogged down the main aisle and waved. The models did a last high speed walk through the Rose Salon, and retreated. The supermodels posed for pictures. The reporters typed on their tablets. The buyers scurried into a private room to discuss their orders. And Perk and I sauntered out into the sunlight of a beautiful fall Paris afternoon. Someone pressed a long-stemmed rose into my hand. We shook our heads – dazed a little by the long anticipation and the surprising quick delivery of the show. How could it be over so fast!? No taxi was to be found, so we decided to walk to a restaurant, any restaurant, for a very late lunch. 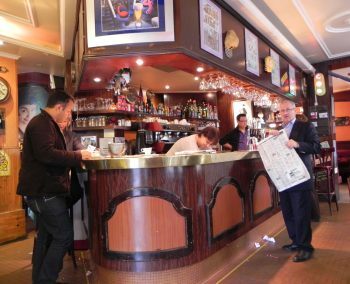 We turned into the first place we saw … a brasserie … that surprised us by offering off-track betting in addition to traditional fare. We sipped our wine. The men at the bar placed bets on televised horse races and cared nothing about couture. What an amazing experience! You go girl and keep updating us with the Paris adventure..
How exciting! When you return please promise to go shopping with me for my personal collection of ready to wear. Cyndee & Perk…you never cease to amaze me. I keep wondering what you’ll be doing next that will give us another awesome story. Look forward to your next chapter. Miss you! What an experience! I’m enjoying the fact that Robert DeNiro and Kanye West were in the same room. When I grow up I want to have similar adventures as you and Perk! I am so happy that you are having such a wonderful time. Loving the blogs. Such a dream and so happy for you both. Loved the shot of DeNiro! You both looked gorgeous, dahling!! !